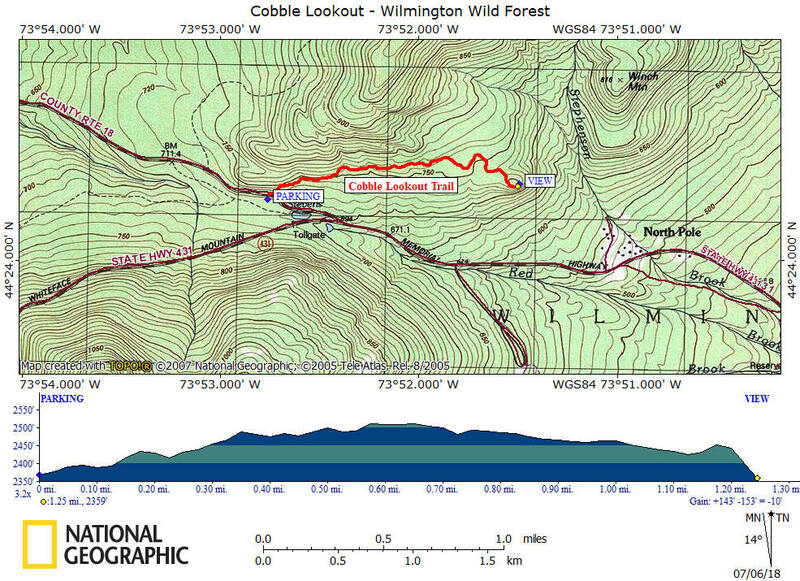 Cobble Lookout is located in the Wilmington Wild Forest of the northeastern Adirondacks, near Whiteface Mountain. This short, easy 1.3 mile one way hike features spectacular views of Whiteface Mountain, Giant Mountain and the Lake Champlain Valley. This is a hike that can be enjoyed by everyone in your family. The trail was built in 2014, is marked with blue DEC markers and is mostly level. It is becoming a very popular hiking destination away from the overly crowded High Peaks Region. This is also known as Cobble Ledge in the latest ADK Guide Book High Peaks Trails . The Cobble Lookout Trail follows an old road from the parking area for the first 500 feet or so to an old quarry. Now starts the new trail and at 0.2 miles the trail ascends rock steps on its only real climb of this hike. At just about one mile of hiking you'll turn right on what was probably an old logging road. You'll cross a small brook before reaching the lookout at 1.3 miles. Look below for pictures, video and a map of this hike. The overall elevation gain on this hike is about 140 feet. Very easy hike that can be enjoyed by most of your family. Directions: From Wilmington and NY 86, take NY 431. At the County Route 72 junction, veer right onto CR 72 and drive 0.3 miles. The trailhead parking area is on the right. The parking area is small and most people park along the shoulder of the road. There is a DEC sign at the parking area. The GPS coordinates of the parking area is N44 24.232 W73 52.724.